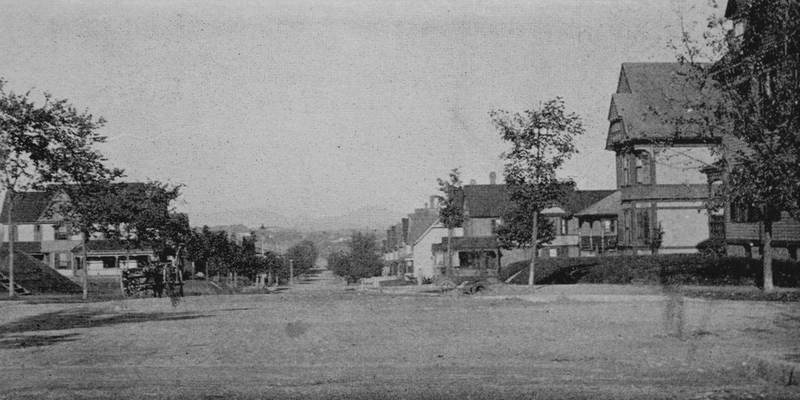 Looking north on Beech Street from the corner of Cabot Street in Holyoke, around 1892. Image from Picturesque Hampden (1892). 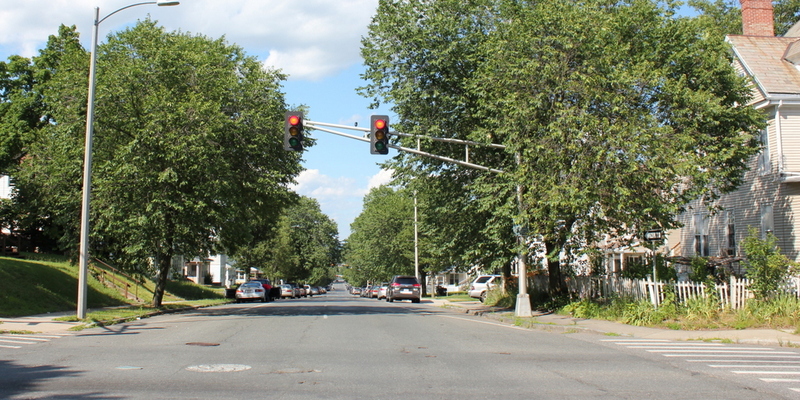 Holyoke is one of the few New England cities to have a regular street grid, which was a result of its planned development in the mid-19th century. The downtown area consists of rectangular blocks, with some streets running roughly north to south, parallel to the canals along the Connecticut River, and perpendicular streets running east to west, up and down the hills to the west of the river. West of High Street, the north-south streets are all named for trees (Maple, Elm, Walnut, etc. 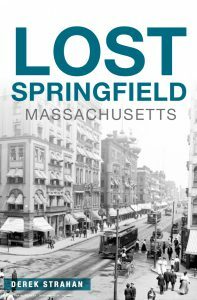 ), while the east-west streets alternate between those named for Massachusetts counties (Franklin, Hampshire, Essex, etc.) and those named for early Holyoke industrialists (Jackson, Sargeant, Cabot, etc.). By the late 19th century, houses in Holyoke were, in general, more desirable the further up the hill that they were located. Beech Street, which is seen here around 1892, is six blocks to the west of High Street, and at the time it largely consisted of upper middle class, single-family homes. At the time, the neighborhood had not yet been fully developed. Most of the houses were new, having been built around the 1880s, and there were still vacant lots on this block, including some in the foreground on the left side. The 1900 census gives some insight into the people who lived here on this section of Beech Street. On the far right, at the corner of Cabot Street, was the home of Lewis E. Bellows, the treasurer and manager of the Barlow Manufacturing Company, which produced store and window display fixtures. Just beyond his house, at 232 Beech, was the home of William Mauer, a German immigrant who worked as secretary and manager of Germania Mills, which produced woolen and worsted textiles. Further down the street, at 226 Beech, was the home of William Judd, who worked as a traveling salesman for a paper mill. In the years after the first photo was taken, the vacant lots on either side of the street were developed, and new houses were built around the early 20th century. Since then, there have not been any significant changes, and most of these turn-of-the-century homes are still standing, although many have been altered with enclosed porches, artificial siding, and other changes. Only one house – the one on the right at 232 Beech – appears to have been demolished, but it has since been replaced by a modern house on the same site. The Park Street School at the corner of Park and Hamilton Streets in Holyoke, around 1892. Image from Picturesque Hampden (1892). 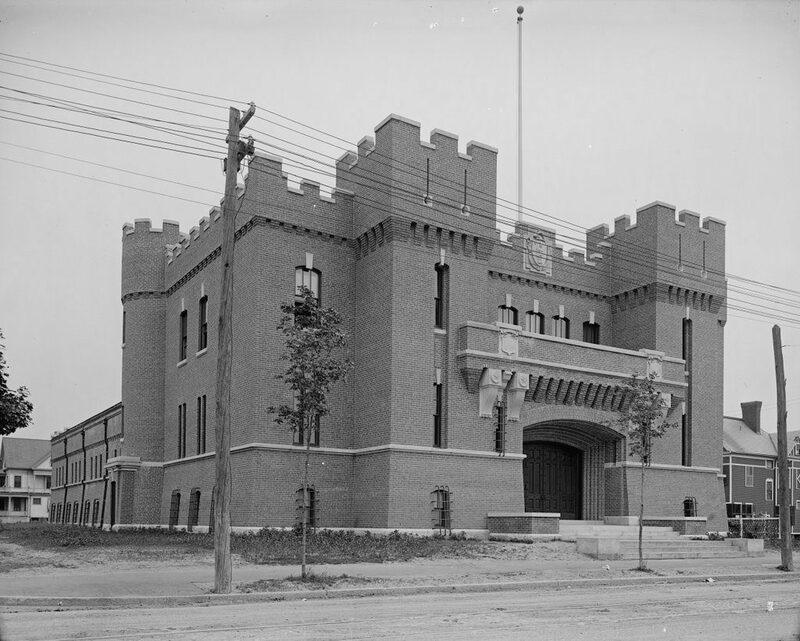 The caption in Picturesque Hampden identifies this as the Hamilton Street School, but it is actually the Park Street School, which is located just across the street from where the Hamilton Street School once stood. It is perhaps the oldest surviving school building in the city, and dates back to 1868 when it opened as a public school. Like many other buildings of this period, it had Italianate architecture, and it featured a symmetrical front facade with a tower in the center. Just beyond the school, on the left side of the first photo, was the Precious Blood Church, a High Victorian Gothic-style French Catholic church that was completed in 1878. In 1875, the Park Street School played a grisly role in one of the deadliest, yet also one of the least-known disasters in Massachusetts history. At the time, the Precious Blood Church was under construction, and the parishioners, largely French-Canadian immigrants, worshiped in a temporary wooden church, located behind the right side of the school at the corner of Cabot and South East Streets. The wooden church, built in just a month in December 1869, had a capacity of about 800, and included a large balcony that could seat about 400. On May 27, 1875, the church was filled with some 600 to 700 worshipers for an evening Corpus Christi mass, but toward the end of the service a lace curtain, blown by a stiff breeze through the open windows, touched a lighted candle and caught fire. The fire on the curtain quickly spread to the wall, and within minutes the building was engulfed in flames. Those on the ground floor of the sanctuary had a fairly easy escape route, through any of the three front doors of the church. However, those in the balcony had only a narrow stairway that led down to the front entrances, where the crowds from the ground floor were also trying to escape. One of the doors eventually became blocked by people who had tripped over each other, and firemen worked desperately to free people from this pile in what little time they had. In particular, future fire chief John J. Lynch – namesake of the former John J. Lynch Middle School – was noted for his bravery in rescuing survivors, and thanks to the efforts of Lynch and other firemen, the death toll was not as high as it otherwise may have been. Within just 20 minutes of the curtain brushing against the candle, both the church and the adjacent rectory were completely destroyed. The next step was to recover and identify the bodies of the victims, and the Park Street School was converted into a morgue. The bodies were laid out here in the basement by the following morning, and friends and family members of the victims arrived to identify their loved ones. Many of the bodies were burned beyond recognition, and were only able to be identified by clothing, shoes, jewelry, and other personal effects. The total number of deaths in the fire has been variously listed as low as 74 and as high as 97, although the lower figure is probably closer to the true count. The language barrier likely contributed to some of the discrepancies, and in some cases spelling variations of the same name were apparently recorded as two different people. Either way, though, it ranks among the deadliest fires in the history of the state. By way of comparison, the Great Boston Fire of 1872, which occurred less than three years earlier, destroyed 776 buildings in densely-populated Boston, yet had a death toll of about 20 to 30, only about a third of that of the Precious Blood Church. At the time of the fire, the new Precious Blood Church was already under construction, but work had not progressed much further than the basement. Nonetheless, two days after the fire a funeral mass was held for the victims, and about 2,500 people crowded into the still-unfinished basement, which had been hastily roofed with boards for the occasion. So many people in such a confined, makeshift space could have posed an even greater danger in the event of a fire, but the funeral passed without incident, and most of the bodies were subsequently interred in a mass grave in the Precious Blood Cemetery, located across the river in South Hadley. Today, despite such a substantial loss of life, the Precious Blood Church fire has been largely forgotten, and here in the South Holyoke neighborhood there are few reminders of the tragedy. 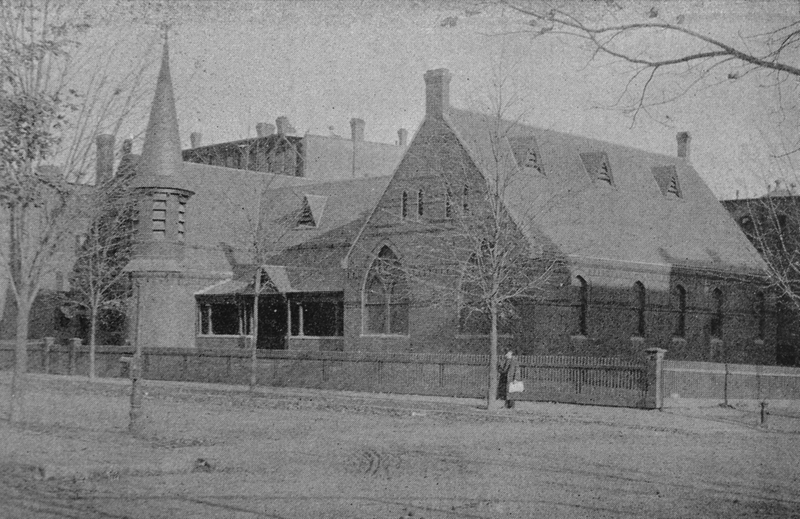 The new Precious Blood Church, which was completed in 1878 and is seen on the left side of the first photo, closed in 1989, and was demolished soon after. Probably the only surviving building with a connection to the fire is the Park Street School, which still stands here in a somewhat altered state. It continued to be used as a school for many years after its use as a makeshift morgue, but around 1930 it was sold to the church, becoming a convent and chapel. At some point, the tower was removed, and the building saw other alterations such as additional windows on the second floor, but overall it is still recognizable from its original appearance, and stands as a good example of mid-19th century school architecture. 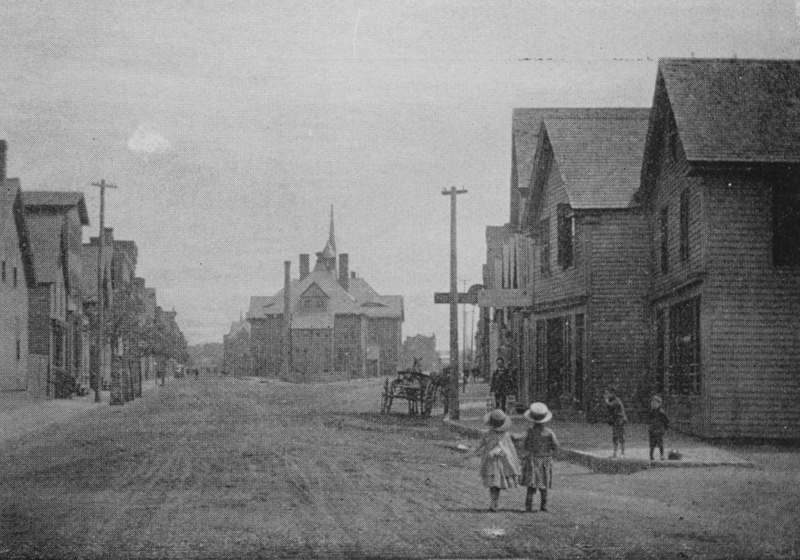 Looking north on Park Street from the corner of Adams Street in Holyoke, around 1892. Image from Picturesque Hampden (1892). This view shows the scene from Adams Street, looking north toward the triangular park between Park Street (now Clemente Street) on the left and South East Street on the right. Here, the street grid of the South Holyoke neighborhood, which runs parallel to the Third Level Canal, meets the street grid of the rest of the city. This formed a small wedge of land in the center of the photo, just south of Sargeant Street, as well as a larger one just beyond it, in the block between Sargeant and Hamilton Streets. Originally known as Hamilton Park, and later the Hamilton Street Park, this was the largest open space in the neighborhood, and the first photo shows a mix of wood-frame and brick buildings on either side of the street. Further in the distance, in the center of the photo, is the Hamilton Street School, located on part of the triangle between Hamilton, Park, and South East Streets. 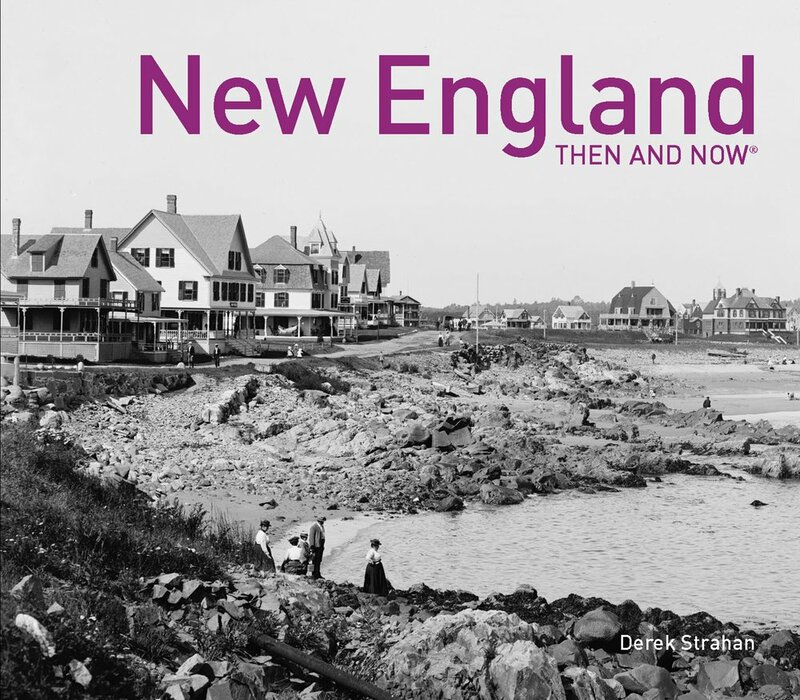 When the first photo was taken, this neighborhood was predominantly French-Canadian, although there was also a considerable German population as well. The 1900 census, which was done only a few years after the first photo was taken, gives some interesting insight into this neighborhood. For example, the house on the right was owned by August Ruppert, a 46-year-old German immigrant who ran a grocery store in the first floor of the building. He had immigrated to the United States in 1882, followed a year later by his wife Mary and their two young children, Richard and Annie. They had a third child, Emma, several years years later, and by 1900 they were living here in this house, with Richard working as a plumber and Annie as a weaver in a woolen mill. The census also shows On Wo living right next door at 282 Park Street. A Chinese immigrant, he was about 38 years old, and he worked as a laundryman, probably in the second storefront on the right side of the photo. Today, nothing is left from the first photo except for the park and the streets themselves. Even then, they have undergone changes, with the Hamilton Street Park becoming Carlos Vega Park in 2012, and Park Street becoming Clemente Street. A 1911 city atlas shows over 40 buildings in this two-block section of Park and South East Streets, but today there are only five, with overgrown vacant lots comprising most of the streetscape. 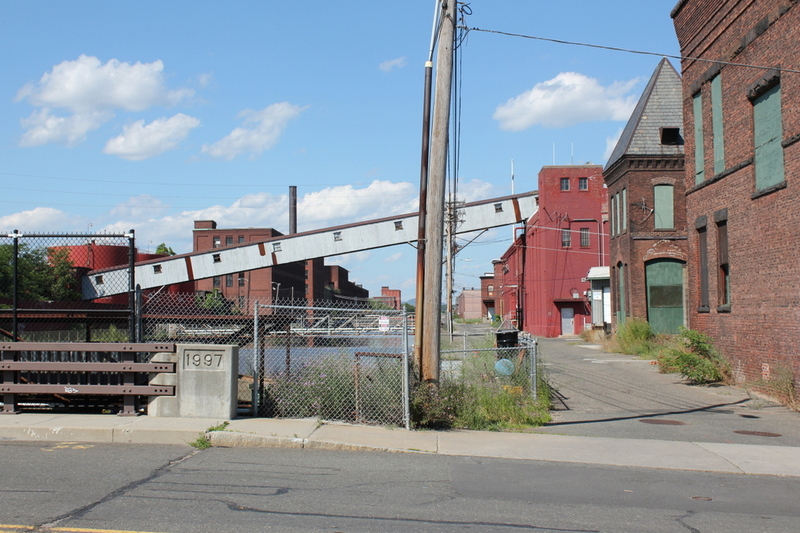 The present-day photo shows the effect that the loss of manufacturing jobs has had on Holyoke, and similar scenes can be found in other once-thriving neighborhoods in the city. 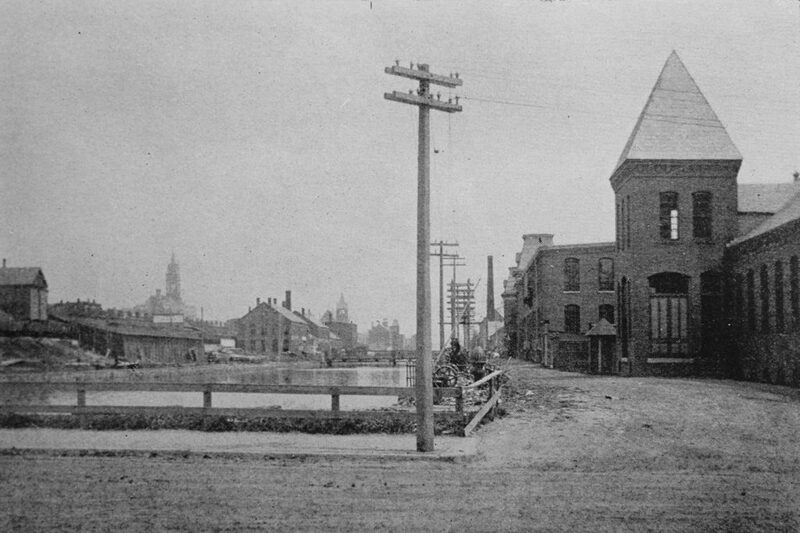 Looking north along the First Level Canal from Sargeant Street in Holyoke, around 1892. Image from Picturesque Hampden (1892). This view shows the scene from near the southern end of the First Level Canal, looking north toward the center of Holyoke. The tower of City Hall can be seen in the distance on the left side of the first photo, and the foreground shows a variety of industrial development along both sides of the canal. Furthest to the right is the George R. Dickinson Paper Company, one of the many 19th century paper mills in Holyoke. The two-story brick mill was built in 1880, and initially housed two machines that produced book papers. The company’s owner, George R. Dickinson, lived in a mansion in Springfield, and he ran the company until his death in 1887. George’s son Henry then took over the company, and in 1890 he expanded the building to increase production. The first photo was taken several years later, with Picturesque Hampden describing how “it is now the best equipped mill of its kind in Holyoke, and its productive capacity ranks with the five largest in the United States.” At the time, it was operating day and night in order to keep up with demand, and it had a daily output of around 23 tons of paper. In 1899, the company was acquired by the American Writing Paper Company, with Henry Dickinson becoming its vice president. This mill continued to operate under the new ownership, and was expanded at some point after the first photo was taken, with an addition on the far right side of the photo. Otherwise, the building is still recognizable from the first photo, particularly its distinctive tower. Although no longer a paper mill, it is still in use as a factory, and today it produces plastic clamshell packaging. Aside from the George R. Dickinson Paper Company, the other buildings on the right side of the canal are also still standing, although they too have been altered over the years. 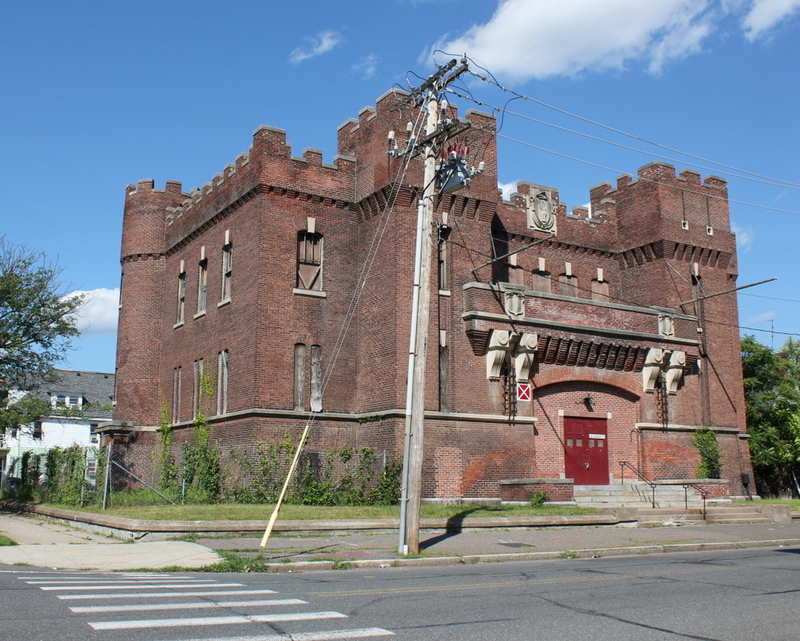 The next building, just to the left of the tower, was owned by the Holyoke Water Power Company, although it later became the city’s municipal electric light plant. The building appears to still be standing, although it has been expanded and now includes a covered walkway across the canal. 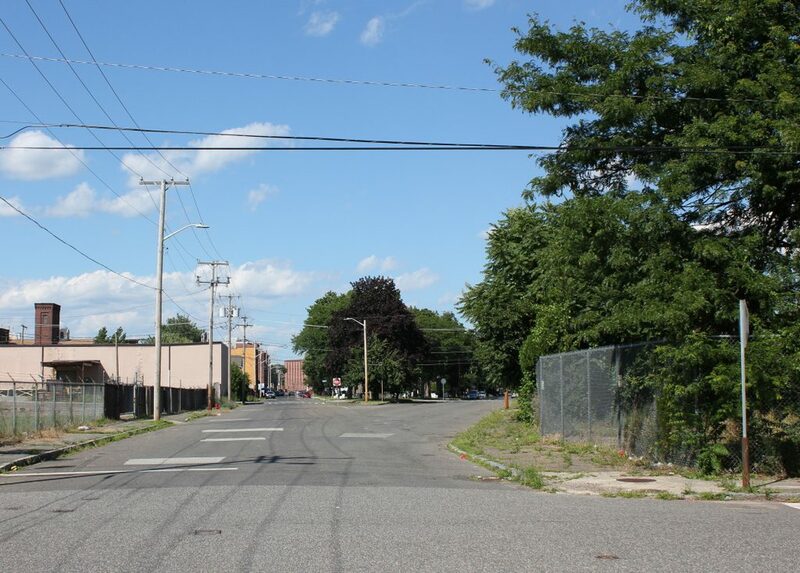 Further in the distance, barely visible in the two photos, is the former Crocker McElwain paper mill, which is still standing at the corner of Cabot Street, although without its original towers from the first photo. 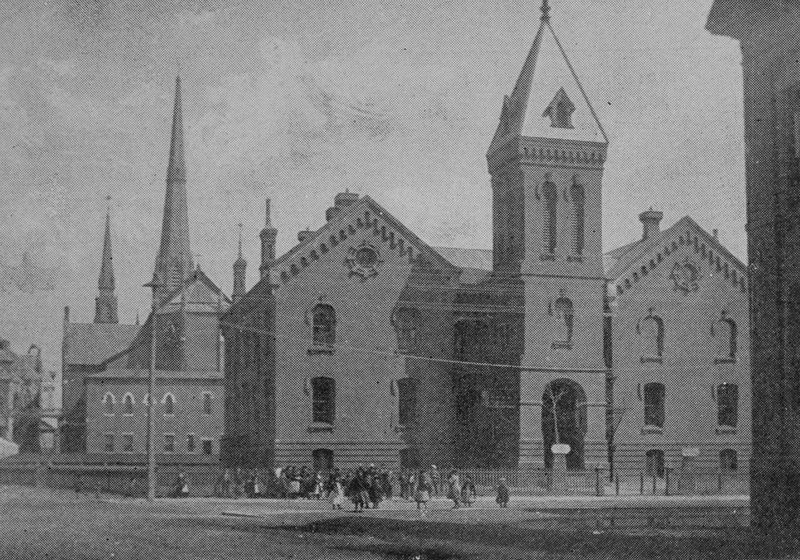 The Unitarian Church at the corner of Maple and Essex Streets in Holyoke, around 1892. Image from Picturesque Hampden (1892). The first Unitarian church in Holyoke was established in 1857, but it only lasted for about a year, and the city’s Unitarians would not form another church for more than 15 years. Finally, in 1874, the Liberal Christian Congregational Society was established with 55 members, and the church met in several different temporary locations for the next two years. 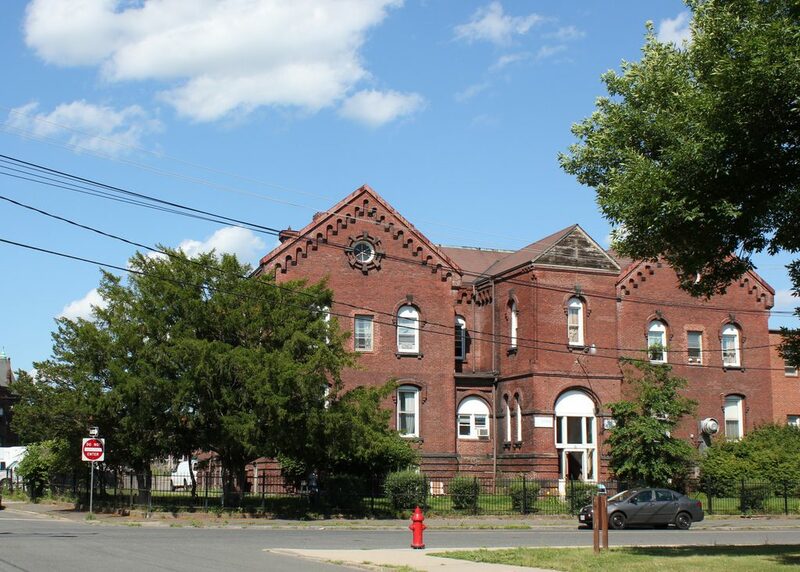 In 1875, the Holyoke Water Power Company donated this lot at the northeast corner of Maple and Essex Streets, and construction of a church building began later that year. The building was completed in 1876, and originally consisted of just the section on the left side of the first photo, to the left of the tower. However, in 1889, the building was significantly expanded to the right, with a matching addition that more than doubled its capacity. The church remained here until about 1930, but by 1931 it was demolished to build the New England Telephone and Telegraph Company building, which still stands here on the site. 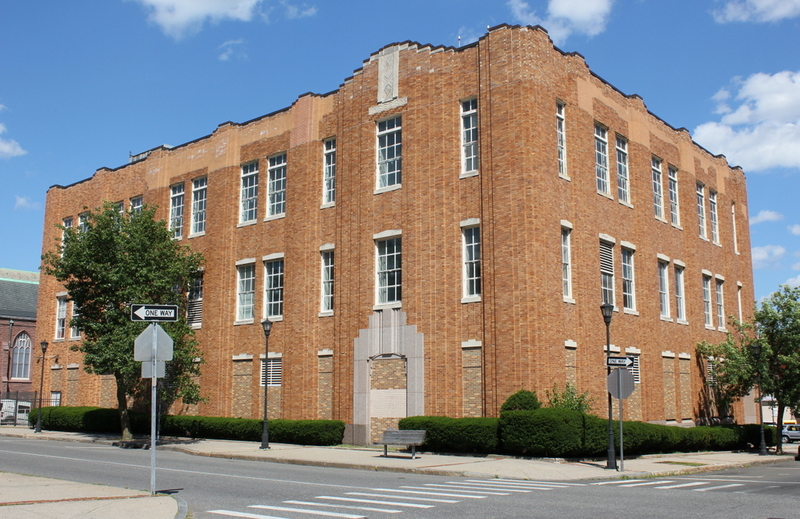 Its exterior has been altered over the years, and the first floor windows and doors have been bricked up, but it remains as one of the few Art Deco-style buildings in Holyoke.